Bolt-On 47° 50mm - 2"
ARDMCA1 10mm Armin Point Long: Soil Disturbance approx. 50mm below closing wing. ARDMCA2 10mm Armin Point Short: Soil Disturbance approx. 25mm below closing wing. The unique design of the McCoy Armin point features an inbuilt closer wing known as the "Armin Wing", set immediately behind the narrow knife blade. 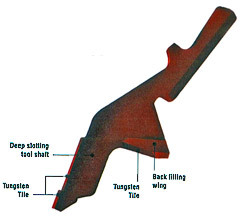 Tungsten tiles are incorporated in key wear areas for prolonged tool life. The Armin Wing allows for precision control of Seed Placement for better germination. This closer wing back-fills the slot prior to seed delivery: preparing a lightly compacted and consistent seed bed for uniform sowing depth. The McCoy Armin can be ideal in early season sowing or when sowing conditions involve reduced soil moisture levels. The Armin Wing can help with Moisture Retention: once the slot is closed by the Armin Wing, soil moisture is more readily retained where it is most needed for the early growth stages after germination. Tilled soil is forced down underneath the Armin Wing to form a uniform seed bed immediately behind the knife. This helps keep Soil Throw to a minimum. It is recommend that you contact G W Tillage for comment on your machine specifications and suitability for soil type(s) prior to purchase.